Catching up on blogging about my travels in December and January, here are some photos from running three half marathons in three consecutive weekends. Since I love to travel and run, why not combine the two and make it a great adventure? I started with the Angkor Wat International Half Marathon on 7 December 2014 in Siem Reap, Cambodia. It was well organized and awesome to run next to the ancient ruins. The race started early but the heat still was an issue, so I was thankful the course was mostly along the tree-lined roads. 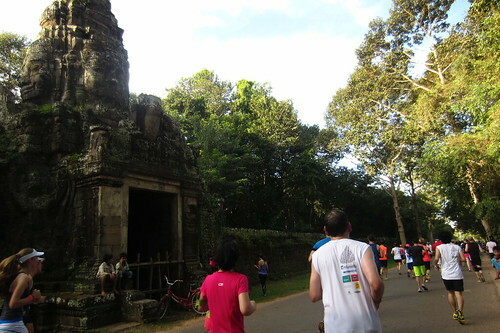 Running next to Angkor Thom. 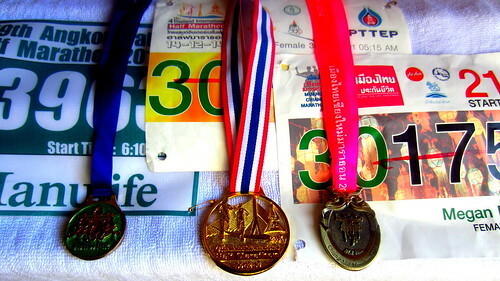 Angkor Wat International Half Marathon. Next was the Thailand Half Marathon in Bangkok, Thailand on 14 December 2014. This one was more of a local event, but still well-run. It started at the Rama VIII bridge and continued along the elevated highway, so there wasn’t much scenery. Still an awesome race. Story from race day: my hotel was a couple kilometers from the start line, and with an early AM start, I set out to find a taxi. But the taxi driver I got didn’t speak any English and seemed to not even understand when I pointed at the map exactly where I wanted to be dropped off and to my race number pinned to my shirt. Maybe he was reluctant to drop a white lady off at a random place, but anyway I jumped out of the cab and ran to the start line, since I already knew how to get there–made it with 10 minutes to spare. It pays to know your way around. 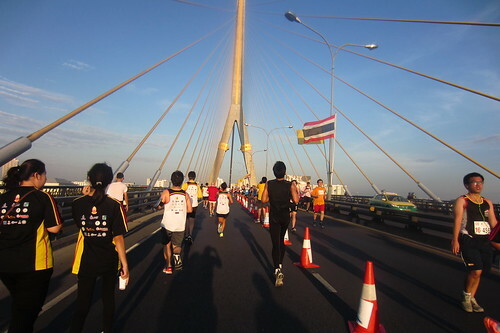 Running across the Rama VIII bridge in Bangkok, Thailand. Finally, to complete my triple crown of half marathons, I ran the Chiang Mai Half Marathon on 21 December 2014 in Chiang Mai, Thailand. Another well-organized run I thought to be really fun. Near the end I swore it felt longer than 21km, but I actually crossed the line for my best half marathon time ever. I stayed so focused I didn’t get any pictures during the race, but I’m darn proud of these medals for all three half marathons. 3 Half Marathons. 3 Consecutive Weekends. 2 Countries (Cambodia and Thailand).